Texas has been known to be the state of the beautiful bluebonnets. The time has come for people to go loco over capturing pictures of the flowers with their loved ones and of course a selfie. 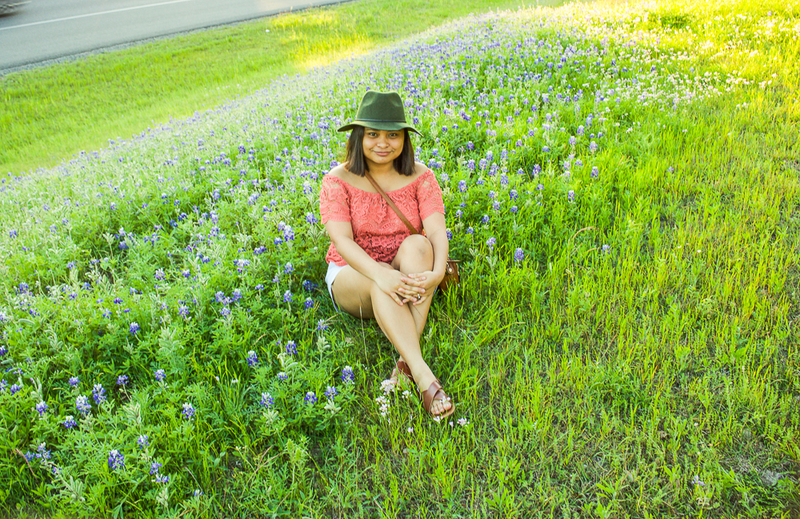 When I moved here in ATx, I never thought I would fell in love with the bluebonnets. At first I was like, "Uh, I don't know." but I eventually did. I mean, how can you not fall for the beauty of the flowers where they are widely spread across the highway grass and even in country homes. My husband once told me a story about it. Texas highways have never been more beautiful if not because of Lady Bird Johnson, the first wife of former president Lyndon B. Johnson. Before she left the white house, she helped push for laws to plant flowers along Texas highways such as the bluebonnet. The purpose for the law was for the state highway's beautification. Thanks to her I am enjoying my Texas Spring every year! Anyway, I really prepared for that day. I went through my closet and wore something that would compliment our errands and the fun shoot. A little loose but comfy and chic. In these pictures, I wore a coral red lace blouse which has been a long time running trend of Spring time fashion here in the South. I paired it with a white khaki shorts and of course my favorite Philippine-made Estela sandals in brown. I've always loved wearing hats, so I pulled out my olive green and it goes along with my mini cognac cross-body bag. My outfit all-in-all have only has cost me less than $40. Why? Because I shop during sales, at off-priced retailers, and at outlets and thrift stores. Nuh-uh, never be ashamed of where you shop. Remember, you can still be chic without hurting your pocket.